For only the second time since the animated TV show The Simpsons made its debut, the Calgary Flames are into the second round of the Stanley Cup playoffs. Yes, just as I predicted last September... doh! Their opponent will be the Anaheim Ducks, who they've faced once before in the post-season -- although back then they were Mighty Ducks. The year was 2006 and to give you a sense of how long ago that was, Edmonton made the playoffs that season. In fact, the Flames and Oilers were on a collision course to meet in the second round -- which would have been their first playoff meeting since 1991 -- when Calgary blew its 3-2 series lead thanks to a 2-1 setback in Anaheim in game 6 and then coming back to the Saddledome and getting shut out 3-0 by Ilya Bryzgalov. Fast forward to 2015 and the Flames enter this series as the underdog but the gap is not as big as you might think. While the Ducks finished 12 points ahead of Calgary in the Pacific Division standings, the Flames goal-differential was higher at plus-25 compared to Anaheim at plus-10. The Flames led after the first period only 18 times during the regular season, finishing ahead of only Detroit (17) and Buffalo (16). While it didn't happen very often, when they did get off to a first period lead, they were lethal, ranking second-best in the NHL at closing games out going 16-2-0. Calgary held first period leads three times against Vancouver and continuing to improve in this area will be key for the Flames. That said, nobody has been better than Anaheim in coming back to win games in which they trail headed to the third period. The Ducks did it 12 times in the regular season and three more times against Winnipeg in round one. With the Flames having been one of the NHL's best third period teams in terms of both goals for (99) and goals against (68), make sure you're comfortably back in your seat for the third periods in this series and whatever you do, don't leave early. The Flames deployed five rookie forwards in the series against Vancouver with four playing in all six games and playing key roles. Can Johnny Gaudreau continue to create space for himself and be the spark for Calgary's top line? Can mayoralty candidate Micheal Ferland pick up where he left off last series as a human wrecking ball, whose hits often seem to border on charging penalties yet he walked that fine line nearly to perfection. Can Sam Bennett continue to make an impact at such a young age. He's the youngest player still going in the NHL playoffs but you wouldn't know it to watch him play. His arrival has helped spark the Flames secondary scoring. Can Josh Jooris continue to wreak havoc on the Flames fourth line with his energy, speed and insatiable puck pursuit. There have been no signs yet of any of these four rookies (Markus Granlund the other) wilting under the pressure of the moment yet the grind will continue to get tougher as the calendar turns to May so it will be a storyline to monitor. A fascinating angle to this series is the Flames youth up front against a young Anaheim blue-line. Key in round one was Calgary's ability to take away time and space from the Canucks defencemen, who were under attack continually and not able to set up and make plays as they wanted to do. Unable to cope with the ferocious pressure, Vancouver's defence -- Alex Edler, Kevin Bieksa, Luca Sbisa, etc. were all forced into making turnovers repeatedly and they got worn down physically. What remains to be seen is can Calgary pull off the same thing against a younger and more agile Anaheim defense, which features an impressive cast of rising stars not yet age 24 in Simon Despres (23), Cam Fowler (23), Sami Vatanen (23) and Hampus Lindholm (21). While they are quicker than the Canucks blue-liners, they could also be prone to the turnover if Calgary can turn on the heat. If the Ducks prove that they can counter attack quickly, Hartley may need to re-think this plan of attack but we'll see how the first couple games unfold first. In the Canucks series, the Flames did a good job of avoiding too much damage from Daniel and Henrik Sedin. You don't go into a series against star players like that expecting to shut them out, you just want to limit their effectiveness and that's what Calgary did. The twins got their chances still -- Daniel led Vancouver with 22 shots on goal, but between the two of them, they had only two even-strength goals and a total of eight points. The most damage that line did through it's high puck possession time was suppressing the effectiveness of the Flames top line by keeping Calgary's big three in their own end much of the time until Hartley made a point of getting them away from the Sedins in game 6. However, the degree of difficulty goes up significantly against Corey Perry and Ryan Getzlaf, who are both 29 so five years younger than the Sedins. Also, there is equal finesse but more power to their games, which makes the deadly Ducks duo that much harder to contain. Limiting them will be the goal and key in that will be avoiding as often as possible those icing-induced long, long shifts where Anaheim can take advantage by getting their two menacing stars out in lopsided match-ups against tired players. Calgary did about the best they could in round one in taking a 3-2 lead in games without getting a sniff of an even-strength goal from their top line. That same formula probably doesn't get it done against Anaheim. In fact, you probably don't get a game five if Gaudreau, Sean Monahan and Jiri Hudler are skunked early in the series once again. The good news is in breaking out big-time in game 6 with a combined 10 points, not only did the three of them have their mojo back but suddenly the fears that Monahan and Hudler were nursing injuries subsided. The four days off between series will really help these three Flames, who shoulder so much ice time and responsibility. There was no shortage of unsung heros for the Flames against Vancouver and given the top line's ineffectiveness until game 6, the reason Calgary's season is still alive was the strong series turned in by the likes of Mikael Backlund, Bennett, Joe Colborne, David Jones, Matt Stajan and Ferland. If there are three guys from the Flames bottom nine that I'd expect to shine once again it's Bennett, Backlund and Jones. Every time he steps on the ice, Bennett gains more NHL experience and given his raw skills already, the overall package is only going to get better and more dynamic every game. Remember Gaudreau's first five games this year? No points. There's an adjustment that comes with stepping into an NHL game. This what Bennett is going through right now although it might be hard to tell because he's already been good. Also, he hasn't played nearly as much hockey as anyone else on the team and that freshness should become more noticeable as the post-season grinds on. Backlund was terrific against Vancouver and while it didn't translate to goals and assists -- was credited with just one helper, don't be surprised if he does cash in a lot more this series. He led Calgary in shots on goal and scoring chances against Vancouver and expect the pucks to start going in soon. As for Jones, finally enjoying a long stretch of staying healthy, he's showing the power forward-type of game that Calgary was so attracted to when they got him from the Avalanche two years ago. Playoff hockey is bringing out the best in Jones' overall game. During the regular season, the Ducks power play was 28th. I'm not buying it. I see them as dangerous and in going 3-for-11 on the man advantage against Winnipeg, they showed that. Calgary was remarkably disciplined during the regular season and that resulted in them being shorthanded the fewest times of any team. That was a good thing too as the Flames PK was only 20th. However, we did not see that same ability to avoid infractions in round one when they were forced onto the PK 16 times. Putting Getzlaf and Perry out there in a 5-on-4 will be death for the Flames if they do it too often. Meanwhile, Calgary was a potent 5-for-18 on the power play in round one and while that pace isn't sustainable, getting a key goal at a key time when they get the chance will play a big factor. The Ducks penalty-killing during the regular season was 15th and they killed off 11 of 13 against the Jets. Between series, Flames coach Bob Hartley quipped that his big three minute-munching defence -- Kris Russell, Dennis Wideman and TJ Brodie -- never left the ice tub. Same for Deryk Engelland, who has taken on a big role in that core group as well. Playing mainly those four defencemen with David Schlemko as the distant fifth, Hartley is making up for the lack of depth on his blue-line but riding his best guys in games and managing their off-days by keeping them off the ice and giving them rest. Don't expect the early part of this series to be any different. With two days off after game one and then another two days off before game four, the series sets up nice early for Hartley to be able to keep his main horses out there. One thing that could hurt that would be a long overtime game but the Flames have avoided any type of extra time so far. Jonas Hiller was excellent against Vancouver. However, he wasn't the guy in goal when the team celebrated the first round victory. That suggests it's no lock that Hiller will remain the starter for Calgary in this series despite getting the tap to start in game one. Hiller has a long history with the Ducks having played seven seasons in Anaheim. He also has something to prove after he fell out of favour with the Ducks in the playoffs last season. Anaheim's players know Hiller but he knows them also so is there an advantage one way or another? Probably not. Expect Karri Ramo to be on stand-by for the Flames and the Finn could very well end up being a big factor in this series and given the hot streaks he's capable of going on, this is one area that remains a wildcard for the Flames. What we know is Hartley won't be hesitant about making the switch as he's done it all season. Much has been made about the Flames inability to win in Anaheim, a streak of regular season futility that is now sitting at 20 losses in a row since Calgary's last win on January 19, 2004. That said, the Flames team that will take to the ice tonight don't share much of that baggage. First, you have a guy like Mason Raymond, who is 7-4-1 in his 12 career trips to Honda Center and he's also scored six goals in those dozen games. Schlemko (5 wins), Hudler (5 wins) and Russell (4 wins) are some others that have won plenty in Anaheim. Meanwhile, for the Flames rookies, sophomores like Monahan and Colborne, they don't know any better when it comes to the so-called jinx because they've barely been a part of it. It's this element that makes Anaheim not nearly the same haunted house that it's made out to be. This is a new Calgary team so you can park all the historic numbers, which came mostly while half the Flames team were still playing major junior or in college. 11. (Bonus) Who is Returning from Injury? Finding out the Caramilk secret would be an easier proposition this time of year than getting an accurate update on the health of injured players. So you don't really know how far away the walking wounded are for the Flames but as the series drags on and with game four not for another eight days, you start to wonder if Lance Bouma (hand), Raphael Diaz (lower body), Paul Byron (lower body) and even Mark Giordano (biceps) could eventually become available, giving Hartley additional options. Given the war of attrition that the playoffs often can be, you never know what spots in the line-up may end up opening up at around the time one/some of these players might be available. It's something to monitor but in regards to Giordano in particular, while risking re-injury is something you know they won't do, you wonder at what point -- and at what percentage he'd be in terms of his health (65 percent, 75 percent, etc.) that he becomes a better option than the seldom-used Tyler Wotherspoon or Corey Potter. Don't get too optimistic about this happening yet stay tuned on this one. It should be a great series so enjoy. May hockey is a privilege, not a right, so soak it up and relish it. Young Flames with a Chance to Turn the Page on a Checkered Past - Historically, the Flames have been awful when it comes to putting another team away. However this team has absolutely zero ties to those previous teams. It's time for this young club to forge its own legacy. 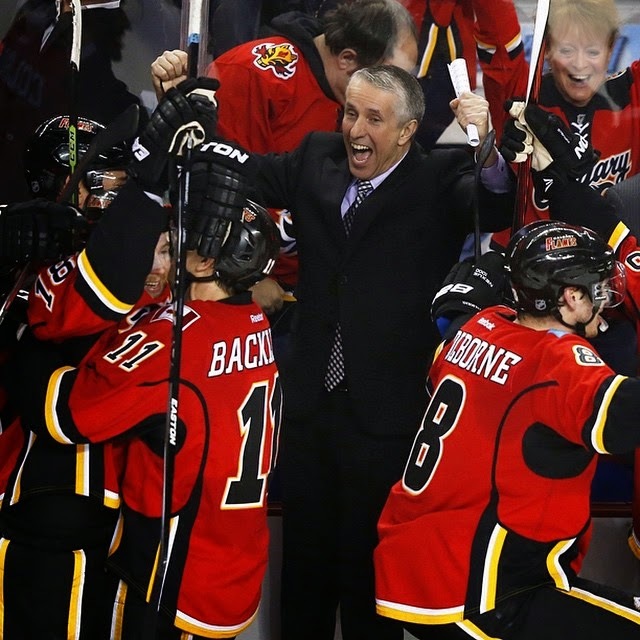 Bob Hartley celebrates, picture by The Calgary Flames. It was the biggest victory for the Calgary Flames in the last decade, for sure. And maybe longer. Given how this upstart team has somehow managed to defy the odds and make it to the final eight in a season that they were supposed to finish in the bottom three, makes you wonder if it wasn't the biggest and most cherished victory by Flames fans in over a quarter century. And on a Saturday night, no less. The Red Mile, by all reports, was electric. I mean, there were some great wins in 2004 and that was a riveting ride that I thought at the time would never again be matched in terms of the Cinderella nature of it but my goodness, this is darn close. Wherever you rank last night's 7-4 series-clinching game 6 win over the Vancouver Canucks on your personal list and it could very well be at the very top for those not old enough to remember 1989, we can all agree it was certainly one of the all-time greats, coming back from a 3-0 deficit less than 10 minutes into the game. 1:02 - Sean Monahan scores to get the Flames to within one at 3-2. 1:52 to 5:14 - Deryk Engelland guts out a 3:22 shift, the longest I've ever witnessed. The Canucks pour on the pressure but can't score. 5:35 - Johnny Gaudreau scores for Calgary to tie the score 3-3. Epic. There's no better way to describe it. Engelland's average shift length was 42 seconds during the regular season. Saturday night -- at a critical juncture in the game, he ends up caught out on the ice for 3:22 or nearly five-times that. That one shift for the Flames No. 29 was longer than Tyler Wotherspoon (3:16) played in the entire game. Four times during that spell the desperate Flames iced the puck. So concerned about how weary his players were, coach Bob Hartley called a time-out after the first icing at 2:52. Heck, at that point Engelland was just getting started. He started the shift with TJ Brodie beside him and the line of Mikael Backlund, Sam Bennett and Joe Colborne. He finished the shift with Kris Russell as his partner and the line of Josh Jooris, Brandon Bollig and Mason Raymond in front of him. Stuck with the longest path to travel -- trapped on the opposite end to the Flames bench and on the opposite side of the ice also, the right defenceman just couldn't get to the bench no matter what. The home bench must have looked like it was located in Red Deer, it seemed so far away. During that period of furious pressure for the Canucks, Vancouver had 10 shot attempts -- four shots on goal, five more blocked (two by Engelland) and one sailed wide. Engelland played against all 18 Canucks skaters that shift including the Sedin-Sedin-Hansen line two separate times and the Verbata-Bonino-Baertschi line twice also. Vancouver nearly went through two full rotations of their three defence pairings. Finally, Karri Ramo was able to smother an Alex Edler slapshot and get a whistle and to cheers from the appreciative crowd, Engelland dragged himself to the bench. Then, merciless Flames TV host Kristin Hallett grabs Engelland to do the in-arena second intermission interview instead of allowing him to carry on to the trainer's room for his scheduled lung replacement. When the game was over, the under-appreciated Engelland played 24:29, had three takeaways, zero giveaways, was a plus-one, had two hits and got his 6-foot-2, 215 pound carcass in front of a game-high 10 shots, just one shy of the 11 blocked shots the Canucks team had. That much ice time was the third-highest in Engelland's career behind a playoff overtime game with Pittsburgh in 2013 (26:18) and Calgary's playoff spot-clinching win over Los Angeles on April 9 (25:17). As decisive as the Canucks were in getting goals on consecutive shots -- their second and third of the game -- from Brandon McMillan and Jannik Hansen to grab a 2-0 lead 7:32 into the game, Hartley was just as quick with his decision to yank Jonas Hiller right then and there. And when Radim Vrbata deflected Daniel Sedin's pass over Ramo to make it three on goals on four shots and a 3-0 lead, you wondered what Hartley had done. Oh, he knew exactly what he was doing, as the veteran skipper explained post-game. "I spend the entire day here. I'm here at 6:30 in the morning. I always prepare all kinds of scenarios. What happens if I lose a left winger? What happens if I lose a centre? What happens if a goaltender gets hurt or stuff like this. You need to have a plan and that's my job -- to have a plan," explained Hartley, who addressed the matter post-game with his players. "I apologized to Jonas Hiller in front of the entire team. I didn't pull him because I felt it was his fault. I felt it wasn't a good start for us and I needed to jump-start. There was water in the fuel," Hartley continued. "We could have been up 3-0 before they scored their first goal. Miller made some unbelievable saves and they scored some nice goals and I said, there's no way that I'm going back to Vancouver. If we were going to Vancouver, I was going to go down swinging, not get caught looking. I was ready to try everything that I have in the book." Ramo came in, stopped 17 of 19 including neatly poking the puck off the stick of Henrik Sedin as he burst in on net for what could have been the tying goal in the final minute. "Sometimes changing the goalie, it changes the pace of the game and it creates a reaction from the players and our guys answered back," Hartley said. Picking up wins in these types of desperate scenarios are found money and those five points in the regular season ended up being integral in getting the Flames into the playoffs. Saturday night's win got Calgary into the second round for only the second time since 1989. What a moment for Matt Stajan. Just 14 months after the tragic death of his newborn son Emerson and after just recently becoming a father with his wife Katie to Elliot, Stajan notched the dramatic winning goal with 4:17 left in the third period. After gobbling up an errant Edler pass in the neutral zone, David Jones bursts over the blue-line and lets a shot go that Ryan Miller can't handle. Micheal Ferland was stopped on the rebound but on the second rebound, Stajan corrals it, pauses, and looking more like Alex Ovechkin, wrists a perfect shot into the top corner touching off an eruption from the raucous C of Red. "It's so special. It's been such a tough year for my family and this team's been great all year. We found a way and we found a way tonight to be a part of it. It's amazing," said Stajan. Coming 11 years after Stajan's only other appearance in the Stanley Cup playoffs, a three-game stint in his rookie season in Toronto, Hartley says his veteran centre is what this team is all about. "Matt Stajan is a reflection of who we are as a team. A hard worker. Goes hard. You look at the winning goal. That's the Calgary Flames. That's the way we do business," said Hartley. "That's the way we cultivated our identity three years ago and we still have a long way to go to climb the mountain but I'm so proud of those guys. Everyone showed up. We tied the game, gave up a fourth one, we still keep going. Then in the third period, we were who we are. A bunch of young guys that go and have no fear and we don't care and we always find a way to get it done." Centring Ferland and Jones, Stajan finished with a goal and two assists, his first three-point game in over a year and just his fourth in six seasons in Calgary. It was Calgary's second third period comeback of the series, having also pulled out game one after trailing heading into the third period. It was a fitting conclusion to the series given the third period rallies all season -- 10 of them in total, third in the NHL -- were a staple of this team all season, which led radio colour commentator Peter Loubardias to dub them the 'Find-a-way Flames'. For 16 periods, Calgary's top line failed to score an even-strength goal. They were being outplayed by the Canucks top line and it looked like their ill-timed slump might end up costing the Flames the series. Monahan must be hurt was the swirling rumours. Surely Hudler must be also. After all, this was the NHL's top line for the final two months of the season and they were a collective minus-13 with just three power play goals to show for the first five games of the series. Then, everything changed in a heartbeat and led by Hudler, who regained the form that had some people suggesting he could even be a Hart Trophy candidate. At 1:02 of the second, Monahan scores from Hudler. At 5:35, Gaudreau scores on a set-up from Hudler. Then, tying the game 4-4 on the power-play at 6:14 of the third period was Hudler himself, this time set up by his two linemates, a goal that was greeted by a deafening roar from the sell-out crowd of 19,289. The top line finishes the night with a combined 10 points, led by two goals and two assists for Hudler in the first four-point game of his career and from what my late-night research indicates is the first four-point night for a Flame since Lee Stempniak on March 9, 2012. "We had a good game. That's what we've been trying to do all season but the playoffs are different," said Hudler. "You have tough games, they're going to match up against you. When Vancouver is at home, you have to play against great players -- the Sedins are world-class players and Edler and it's tough, but we got it done tonight." Forty hits in six games. That was the physical damage inflicted by rookie Micheal Ferland, who had seven in the clinching game to go along with two goals and one assist. The young man, who turned 23 during this series, not only launched his NHL career against Vancouver but he has solidified himself as an everyday NHL player with his combination of grit, smarts, speed and offence. The one-on-one battle over the past two weeks against Kevin Bieksa, who early in the series referred to him as "irrelevant" turned into a grudge match right out of the 80s and the old Smythe Division wars with the Oilers. Eight of Ferland's hits were against Bieksa himself. Along with those were several verbal jabs and a few of the non-verbal variety to at the end of game three. It was Ferland's first playoff goal on a beautifully threaded pass by Stajan late in the first period that got the comeback started. "That's just the way we play. Never give up," said Ferland. "We just wanted to stick with it. In the back of our minds, we knew we were going to get something going here. It feels so good to get that win." Ferland's second goal came into an empty net with three seconds left. At that point, the Saddledome crowd -- as loud as I recall a crowd ever being -- had already been on its feet for several minutes. "Let's give credit also to our fans. I've never seen this. I've been in great markets. I remember winning the Stanley Cup in Colorado. To see every fan with the Flaming C, wearing it proudly, you almost feel that they're on the bench," said Hartley. "We had to yell our line changes in the third period when we took the lead. We couldn't communicate. It's their passion for our team and it's our relationship." Spend your Sunday soaking up that victory, Flames fans. After all, you were a big part of it. High-Five: Flames Rookies Getting it Done - Five of the Flames 12 forwards in game one were rookies. How absurd is that? There were only 22 rookie forwards in the line-ups of the other 15 teams in game one of the playoffs. I look at the historical significance of that and reflect on what it means right now and for the future. The Time for Sam Bennett is Right Now - What's better than having an ace up your sleeve? Having an ace in your hand. There is a time to be patient with young players and there's a time to be loyal with veteran players. But now it's time for Bob Hartley to ice the line-up he can to beat the Vancouver Canucks four times in the next seven games. That line-up should include Sam Bennett. That's how long it's been since the Flames second power-play unit has collaborated for a goal. It's a funk that goes back to mid-February. David Jones against the Los Angeles Kings on Feb. 12 was the last time it happened. While it sure sounds like a bad skid on paper, I set out to determine exactly how bad it's actually been for that second forward unit made up of players not named Johnny Gaudreau, Sean Monahan or Jiri Hudler. While the sample size is small for Jones and Jooris, I am leaving them in for comparison. Also, Curtis Glencross would have been part of this list but I excluded him for obvious reasons. Any way you slice it, an attempted shot on goal is a good thing as it means you're in the right end of the ice. You don't generate shots if you can't get out of your own end. You don't get them if you are failing to gain the attacking zone. You also generally won't get them if you can't get set up once you do get in that offensize zone. Here are the shot attempts accumulated for the team while each of the forwards have been on the ice on the power play. To level the playing field in terms of ice time, I've broken it down to average shot attempts per two minutes. As you can see, the top unit generates the most. The second unit is a ways back but it's not like they're getting skunked. They're still creating opportunities. First, an explanation for those not familiar with how this works. Not all shot attempts are considered scoring chances even though they may result in a goal. Yes, any shot could go in the net -- even a shot from centre ice, but I think it's a fair to have a minimum requirement for what constitutes a legit scoring chance. In a perfect world, scoring chances would be identified manually where some subjectivity could be applied. However, we have all have better things to do. So instead, I'm using the criteria for scoring chances as applied at the stats website war-on-ice (where all of this article's data has come from). The war-on-ice folks identify scoring chances automatically based on criteria such as shot type/shot distance/timing, all details gleaned from the NHL's detailed play-by-play summaries. It's not perfect but for my purposes, it's close enough. Deferring to the folks that have put a lot more time into analyzing this than me, their criteria is a good-enough proxy to eye-tracked scoring chances so I'm going with it. Here's their definition if you want to know all the grisly details behind their formula. If you drill down further into the number of scoring chances the team is generating while a player is on the ice, you can separate out how many scoring chances each player individually is actually getting. Seeing Gaudreau tumble down the list is not a surprise considering he's often passing and usually setting up Monahan and Hudler. Colborne at the top again, may surprise you, but it's a sign he's getting chances. One observation is every one of Monahan's shot attempts has also been considered a scoring chance. That confirms what my eyes have seen and that's him shooting only from close-range. e.g. The low slot or at the side of the net. Of note, the disparity in Raymond's shot attempts compared to scoring chances suggests many of his shots are coming from the perimeter and are not considered dangerous. This is also something that many of you have likely observed with the eye-test. What we know is approximately two-thirds of every power play goes to the top unit. We've also learned that the team produces more shot attempts while that top line is out there. That line is made up of three very skilled players so this is not a surprise. However, you might be surprised to see that the relative number of scoring chances generated by that second unit isn't that far below the top three. Colborne is a bit above, Raymond is right at the same level and Backlund is a little bit further down. From this, one could conclude the No. 2 unit is putting less rubber towards the net but when they do get chances, they're quite often decent scoring chances. While pressure is nice and chances are great, ultimately it's the most goals that wins hockey games and the most wins that results in taking a playoff series. Actual production versus mere pressure is where things vary differently with the top unit compared to the second unit. Here are the percentage of scoring chances the team has converted while each player has been on the ice. * Note: If you're wondering why Colborne and Raymond each have one goal scored on the PP yet I'm calling the second unit as 0-for-32 games, it's because on the one goal those two were on the ice for, the goal was ultimately created by Gaudreau, who set up Dennis Wideman. I'm not including that goal as it wasn't the full second unit on the ice nor were the two players that were on the ice integral to the goal going in. These numbers would suggest that Monahan-Hudler-Gaudreau have been very opportunistic while the second unit has squandered numerous good scoring chances. Based on the figures above, had that second trio been as opportunistic as the top line, they should have scored 8 or 9 power play goals over the past two months instead of none. While I believe the real truth lies somewhere in the middle, I do think it would be over-generalizing to assume all forwards are created equal. I'd argue Monahan, Hudler and Gaudreau are more offensively-skilled and are simply more dangerous and more accurate shooters than the likes of Colborne, Raymond and Backlund. I wouldn't expect that second unit to ever convert scoring chances at the same rate. However, I'd still argue that the second unit could very well have produced 5 or 6 goals during that time. It's just a matter of time before the second unit will click and perhaps the power play goals will come in bunches once that first one goes in. While no goals in 32 games sounds awful, as you can see, they haven't been nearly as bad as that stat suggests. This is a good thing. Also, while it's a small sample size for Bennett, I have no doubt that his presence will bolster that second unit. I'd also argue that Jones should be in line for some power play time. However, Colborne-Backlund-Bennett would be my second unit at this time and with them being an even-strength line already, that existing chemistry should further help on the man advantage. Maybe it will be tonight in a crucial game six that the second unit finally get rewarded for their efforts as they're long, long over due. Considering the Flames are one win away from reaching the second round of the Stanley Cup playoffs, that timing to break out of this funk would be perfect. 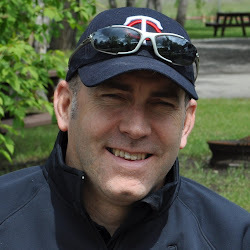 Michael Ferland: Irreverent? Maybe, but Hardly Irrelevant - Kevin Bieksa called Michael Ferland irrelevant after game three, which is laughable considering the Flames rookie has been the polar opposite of that. My look at the huge impact Ferland has had as he establishes himself as a bonafide NHL player. Blow-by-Blow Recap of Friday Night's Fights and What it Could Mean - Here is a blow-by-blow recap of the four primary incidents from game two -- and what it could mean for the Flames -- as tempers boiled over and hostilities returned to a rivalry that long ago left the so-called 'Battle of Alberta' in the dust. The Calgary Flames carry a five-game losing streak into game 5 against the Vancouver Canucks on Thursday night. For real. The last five times the Flames have had a chance to eliminate their opponent from the Stanley Cup playoffs with a victory, they've failed to do so. Five times they've had a team on the ropes and five times they've let their opponent slip out of that noose. The good news is none of this recent baggage -- not even one single, measly carry-on item -- belongs to any of the players on Calgary's roster today. For the current group and that includes coach Bob Hartley, those past results are no more relevant to today's situation than old black and white footage of ship wrecks you see on the History Channel. Not one player, not even injured captain Mark Giordano, who tops the Flames in tenure, played in even one of those five games. 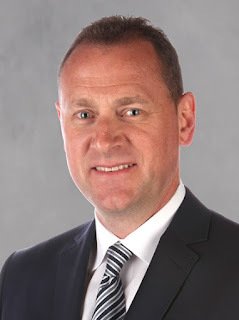 The only player to appear in that last game against San Jose, who is still in the Flames organization, is Craig Conroy, now the assistant general manager. Elsewhere in NHL - Jiri Hudler was in Detroit, Dennis Wideman in Boston, Kris Russell in Columbus, David Jones in Colorado, Jonas Hiller in Anaheim, Matt Stajan in Toronto, Mason Raymond in Vancouver. Overseas - Mikael Backlund was in Sweden, Mark Giordano was in Russia. Junior - Brandon Bollig was in USHL, TJ Brodie in OHL, Joe Colborne in AJHL. Minor Hockey - Sam Bennett was playing Peewee, Johnny Gaudreau, Sean Monahan and Tyler Wotherspoon were in Bantam, Micheal Ferland and Josh Jooris were in Midget. Interestingly, two players in the Sharks line-up in that 2008 game were Devin Setoguchi and Douglas Murray, both of whom were seen around Calgary for parts of this season although obviously are not with the team any longer. In fact, one could also argue Calgary's current group is actually 1-0 when they have a chance to eliminate a team as that was the exact script on April 9. It was not the playoffs technically, but was as similar in circumstance as it could get when the Flames knocked off Los Angeles 3-1 at the Saddledome to officially extinguish the Kings post-season hopes. The players that are still having nightmares about all those opportunities they let slip away from 2004 to 2008 are all long gone. There were four players that appeared in all five of those heartbreakers -- Jarome Iginla, Miikka Kiprusoff, Stephane Yelle and recently retired Robyn Regehr. The misery surrounding the Flames inability to put a team away extends all the way back to right after Calgary won its only Stanley Cup in 1989. The lone bright spot was 2004 thanks to the heroics of Martin Gelinas. Now a Calgary assistant coach, Gelinas scored the series-winning goal each time as the Flames temporarily reversed the jinx and won three consecutive games when they had their opponent on the brink. Of note, there were five players that appeared in each of those games during that six-game stretch from 1991 to 1995. However, I'm going to give Joe Nieuwendyk and Theoren Fleury a pass as they also have Stanley Cup rings from 1989. That leaves three players to shoulder the burden of being the face of the Flames post-Stanley Cup failings. The three players that played in all six of those disastrous losses from 1991 through 1995, but didn't arrive in Calgary until after the Stanley Cup season were Ronnie Stern, Robert Reichel and Frank Musil. Fair or not fair, those early-to-mid 90s years and all those missed opportunities to build off the championship season, will always be a dark chapter in the team's history with those three on the cover. Of course, the subsequent drafting at 6th overall of Daniel Tkaczuk (1997) and Rico Fata (1998) didn't help matters either. But that's a topic for another day. If you think about it, both teams heading into tonight's clash in Rogers Arena have ugly historic records that they pack with them. The Canucks have lost 13 of their last 15 playoff games going back to game six of the Stanley Cup final in 2011. Calgary isn't much better having lost 12 of its last 15 playoff games in which it could eliminate its opponent with a victory. That said, the circumstances are very different. While none of the baggage from past failings belongs to any current Flames, that's not the case for Vancouver. Even without injured Alex Burrows, there are eight other regulars that have been with the Canucks the entire time and sport the scars from these last five years of playoff frustration -- Daniel Sedin, Henrik Sedin, Alex Edler, Jannik Hansen, Dan Hamhuis, Kevin Bieksa, Chris Higgins and Chris Tanev. The best part about history is it's exactly that -- history. It's in the past and while there are so many losses in there that haunt Flames fans to this day -- especially the 40-plus crowd, the current club led by six rookies are creating their own legacy and so far, it's been the opposite to what Calgary fans have grown accustomed to. In a refreshing change, underachieving is out and overachieving is in. The whole 2014-15 season was like that. Overcoming an eight-game losing streak was an example of that. Going 15-7-3 since Giordano got injured is another example of that. Leading 3-1 in games over the Vancouver Canucks while being the series underdog is yet another example of that. Thankfully for Flames fans, it appears a new era is finally upon this city. It's time for Brodie to make people forget about Musil. It's time for Ferland and Bennett to exorcise the ghosts of Stern and Reichel. That first chapter in the Flames new history book could be wrapped up tonight with a win in Rogers Arena that would punch their ticket to the second round for just the second time in 26 years or more so, make it one-for-one in terms of playoff appearances and playoff series victories for the new Monahan-Gaudreau-Bennett era, which is a better and more fair way to look at it. Irreverent, perhaps, about the higher-seeded team he's playing against and the more experienced veterans players he's battling against. But irrelevant? Oh man, hardly. Of all the words in the English language, "irrelevant" was how Kevin Bieksa on Sunday night chose to grossly understate the role Micheal Ferland has played so far in the testy first round series between the Calgary Flames and the Vancouver Canucks. This, of course, was about a half-hour in real time after Bieksa essentially jumped the irrelevant Flames rookie in the Canucks corner with 1:06 to go and threw three or four punches before Ferland could even get his gloves off. The type of vehicle Ferland drives (surely a Ford F-150 or something similar). Irrelevant. The number on the back of Ferland's jersey (79 for now but surely changing this summer, perhaps to his recently vacated junior number of 27). Irrelevant. The impact Ferland has had on this series. Not irrelevant. Ferland played his 29th NHL game Sunday night. Today, the native of Swan River, Manitoba, celebrates his 23rd birthday. He's young, inexperienced and with a resume as thin as his, many in his position might very well be irrelevant. But Ferland has not been. Not even close. Perhaps Bieksa picked Ferland in his hockey pool because no goals or assists in game three was about the only fathomable way in which Ferland could be described in that way. Ferland's line of Matt Stajan and David Jones may have been the lone Calgary trio to not collaborate for a goal on Sunday, but in crashing and banging their way to a collective 14 hits, they were a giant part of the Flames first playoff victory at the Saddledome since April 22, 2009. Ferland played 12:08 in game three but it felt like he was on the ice twice as much as that. He certainly packed a lot of action into those dozen minutes. "I want them to know when I'm out there," said Ferland. "The biggest thing for me is to use my body. It's so easy to make those hits with that crowd. I love hearing them after every hit so that's awesome." Eight hits gives Ferland 18 in the playoffs, which is tied for third in the NHL behind left-winger Matt Martin of the New York Islanders and Washington Capitals defenceman Brooks Orpik, who each have 22. "Ferly is quite a player and he's just starting," said Flames coach Bob Hartley. "We've got a remarkable young man. So intelligent. You have to be around him to figure out how intelligent this young man is." Hartley says Ferland is making the most of the chance at playing time that arose when Lance Bouma (upper body) was lost late in the regular season. "Right from the get go, he delivered some good, solid clean hits. That's the way that we always play. He's filled in. He's taking advantage of Lance Bouma's injury and he's really creating a good role for himself." "He was basically a 20-year-old that was living like a 17-year-old. When you try to do that in this room and this environment, it becomes very difficult. That's not a knock against Micheal – that's just where he was in his development process." Fast forward to Sunday night and while riding the emotion of a deafening loud crowd, Ferland demonstrated how much he's grown up by being very careful to not get too caught up in it. When Vancouver antagonist Derek Dorsett tried to goad him into dropping his gloves and fighting in the final minute of the second period, Ferland refused. With the Flames ahead 2-1 at the time, one risk was letting the Canucks manufacture a spark headed to the third. Additionally, perhaps -- although it didn't work -- he could have drawn an unsportsmanlike penalty on Dorsett and a power play at that stage would have been huge. There was another instance in the game where Stajan and Jones were already caught in deep and Ferland had a chance to take a run at the defenceman on his side that had the puck. Normally, given the way he had been electrifying the crowd with his punishing hits all game, you would have expected him to run at him and try to staple him. Instead, he wisely curled back back up ice in anticipation of the Canucks breakout, which saved Calgary what could have been a potentially costly 3-on-2 rush against them. When asked Sunday night about the shenanigans at the end of the game and Bieksa initiating that scrap with him, Ferland once again showed his maturity by dismissing it, rather than making it a talking point and giving the Canucks something to pin up on the ol' bulletin board. "The game just got heated at the end, a few guys competing down low. Before I knew it, we were punching each other," Ferland said. If he continues to let his actions do most of the talking, Ferland will continue to be a relevant part of this series, whether or not Bieksa wants to admit it or not. The Vancouver Canucks and Calgary Flames playoff series is officially on after a heated game Friday night in which there were several incidents as the Canucks won 4-1 to even the series 1-1. Here is a blow-by-blow recap of the four primary incidents from Friday night as tempers boiled over and the hostilities returned to a rivalry that long ago left the so-called 'Battle of Alberta' in the dust. Calgary's fourth line was having a good shift in the offensize zone. Getting the puck in the corner, Brandon Bollig sends it back to Corey Potter at the blue-line. Potter makes a D-to-D pass to David Schlemko, who walks the blue-line and sends a wrister through a crowd that hits Lack. With the puck lying at Lack's feet, Bollig swipes at it in an attempt to chip it into the open side but can't get his stick on it and then comes the skirmish. As Bollig continues to pursue the puck as it lies in the crease, he gets shoved from behind and ends up landing right on top of Lack. In Bollig's defence, he definitely got pushed from behind. However, in Vancouver's defence, it was by teammate Josh Jooris, who was also right there in the crease doggedly digging at the puck. While it's true Bollig does not appear to make much of an attempt to get off Lack, the goalie also had his legs wrapped around Bollig's legs so I'm not sure he could have got off him anyway. Luca Sbisa, while jostling with Markus Granlund, tries but fails to pull Bollig off of Lack. Then Jannik Hansen doffs his gloves, climbs inside the net and from the opposite side, tries to yank Bollig off Lack. With a linesman in the net as well, trying to intervene, Lack and Bollig flip over and now Lack is on top of Bollig. Lack eventually gets to his feet and while still clinging to Bollig and with his mask off but his blocker and trapper still on, Lack tries to throw a couple of punches at Bollig with his blocker but only lands a couple of harmless, glancing shots off the back of Bollig's pants. While all this was happening, Kevin Bieksa gives a solid shove behind the net on Jooris, who then goes around to the other post where he is pursued by Ronalds Kenins and the two of them aggressively get their gloves in each other's face and jostle by the goal post. Next, the headlock conga line begins. David Schlemko already has Bo Horvat in a headlock, Bieksa grabs Granlund in a headlock and that's followed by Corey Potter briefly getting Bieksa in a headlock. As a fired up Lack skates away to the cheers of the home crowd, Bollig gets to his feet with Sbisa still grabbing him on one side and Hansen on the other. Penalties - Bollig Cal (roughing), Sbisa Van (roughing). As Chris Tanev pursues a loose puck along the end boards in the Vancouver end, he's stapled heavily into the boards by Micheal Ferland, who did initially take five or six strides -- the definition of a charging penalty in the eyes of the referee (and the rule book) -- before gliding from the goal line and finishing the heavy check that was so impactful it rattled the glass out of place. With a delayed penalty being called on Ferland and Tanev with the puck, the Canucks defenceman curls out front of his net but with Ferland pursuing him retreats back behind it again. Meanwhile, Lack exits his crease by a few feet but in doing so skates into the path of Ferland, who was circling in front with his eyes affixed on Tanev. That leads to a bump in which Lack goes down and the crowd goes wild. Did Ferland attampt to get out of Lack's way? Nope. But Lack was an equal contributor also as he looked like a basketball player purposely trying to draw a charging foul, by getting in Ferland's path, planting his feet and then going down on contact. On his way to the penalty box, Ferland is seen exchanging words with Brad Richardson, who skates by him. Penalties - Ferland Cal (charging). After the puck is turned over deep in the Canucks end, Henrik Sedin leads a rush up ice that would become a three-on-two. Meanwhile, behind the play, Dan Hamhuis gets in the path of Johnny Gaudreau as he tries to pursue Sedin. Gaudreau goes down pretty easily, perhaps attempting (and doing so successfully) to draw an interference penalty. With Gaudreau hanging onto the blade of Hamhuis' stick, and Hamhuis trying to yank it out, Sean Monahan goes after Hamhuis, eventually getting him in a headlock. Those two start wrestling. While that's going on, Jiri Hudler grabs Yannick Weber and tries to keep him from joining the fray. Eventually, after the play is blown down, everyone from up ice -- Dennis Wideman and Kris Russell, the Sedins and Alex Burrows -- end up joining the skirmish too. As cameras pan the bench, Mikael Backlund and Ferland are seen jawing with Bieksa and Derek Dorsett. Penalties - Hamhuis Van (interference). It starts off innocently enough. Ferland's soft backhander is gloved easily and held by Lack. After the whistle goes, Bollig skates towards the top of the crease and gives Hamhuis a shove, who pushes Bollig back. Then all the players on the ice come together and it was on. As Matt Stajan -- with two career NHL fights in his previous 778 games -- tries to pry Shawn Matthias from the melee, Dorsett comes in and shoves his glove in Stajan's face. At the same time, Richardson grabs Stajan from behind and puts him in a tight headlock. Having had enough as the two drift towards the end boards, Stajan throws down his gloves first and he and Richardson square off in a spirited tussle with both combatants throwing a flurry of punches. As they go to the ice, Stajan temporarily has Richardson's jersey over his head. Later, while lying on the ice with Richardson on top, Richardson knocks Stajan in the face with his forearm. Meanwhile in the corner, Dorsett and Deryk Engelland drop the mitts and start chucking with Engelland deemed the instigator by the officials (although late Saturday afternoon, the instigator was rescinded). Dorsett eventually ends up on the ice while Engelland continues to throw punches. With the referee standing three feet away from those two, Hamhuis leaves the other skirmish and skates across and jumps in as the third man. Now, Engelland ends up ends up wrestling with the two of them, eventually all three go to the ice with the two Canucks on top. Dorsett gets off and skates away but only briefly. As Engelland and Hamhuis separate, Dorsett circles back and goes after Engelland again, initiating the second fight between them with an overhand right. Now, a weary Engelland and Dorsett are exchanging punches again. While all of that was going, there was a third skirmish that had begun when Ferland pursued Hamhuis into the scrum after the whistle and the two of them began shoving behind the net. First to join in was Matthias, followed immediately by Bollig. Sbisa and Potter were the last two into that melee and they remained joined together but only jawed at each other. No punches were thrown. Meanwhile, as Ferland was escorted off the ice, he hears it from the Vancouver bench with Horvat and Ryan Miller especially vocal. Penalties - Stajan Cal (fighting, game misconduct), Engelland Cal (instigator, fighting, fighting, game misconduct, game misconduct, game misconduct), Ferland Cal (misconduct), Bollig Cal (misconduct), Richardson Van (fighting, game misconduct), Hamhuis (game misconduct), Matthias Van (misconduct). We'll presumably learn on Saturday if there will be any fines or suspensions. On the surface it would seem like Dorsett got off fairly light considering the second fight with Engelland was initiated by him. But, my understanding is Engelland's game misconducts came for three different reasons (being the instigator in the initial fight -- but this was later reversed, reportedly continuing on fighting after being told to stop, having a second altercation). Either way, you get the sense that this is going to be a war destined to go six or seven games and there will be plenty of fireworks still to come. What also remains to be seen is will Friday's events serve as a rallying point for Calgary. They played a very poor game in game two and need to get themselves back in the series and at least emotionally, that has certainly happened. Calgary is sorely missing Lance Bouma as this type of war would be right up his alley but he's not an option right now. The Flames need to get the likes of bigger players like David Jones and Monahan involved more physically -- like Ferland has been -- and while that has not been an element of Monahan's game thus far in his career, his showing of some anger Friday when jumping in to Gaudreau's defence could be a really good sign as he certainly has the size to back it up. It's important in order for the Flames to have a shot at winning this series that Gaudreau and Hudler aren't pushed around and overall, Calgary needs to be a more difficult and frustrating team to play against. Man, if you thought fans in Calgary were already excited about seeing their first playoff game in six years, imagine the mood now as the tempers of both of these two teams rise. The atmosphere on Sunday night at the Scotiabank Saddledome is going to be off the charts. Last year, when John Tortorella and the Canucks met the Flames at Rogers Arena on January 18 and engaged in that famous line brawl off the opening face-off, that was the beginning of a whole new Flames team. Calgary played much improved from that point forward and as a bit of foreshadowing, finished last season 19-14-1 and as one of the Western Conference's top eight teams. While that incident was always shrugged off by coach Bob Hartley as well as the players as more of a coincidence than a correlation, connecting the dots would suggest otherwise. We'll learn in the next week if last night's incident will have a similar rallying effect. Five rookie forwards out of 12. Johnny Gaudreau. Josh Jooris. Markus Granlund. Michael Ferland. Sam Bennett. All of them were in the line-up Calgary coach Bob Hartley rolled out in Vancouver last night in game one of the Stanley Cup playoffs and they collectively got it done as the Flames got third period goals from David Jones and Kris Russell -- both set up by rookies, to win 2-1. Add in sophomores Sean Monahan and Joe Colborne and 58 percent of Calgary's forward group were not in the NHL two years ago when the Flames parted ways -- and in a variety of ways, with the old guard of Jarome Iginla, Alex Tanguay, Jay Bouwmeester and Miikka Kiprusoff, and officially began the rebuild. To have that much youth in the line-up during the playoffs is absurd. That's typically the formula for how you compete for draft lottery positioning, not compete in the post-season. To put that number in perspective, the other 15 NHL teams in their first game on had 22 rookie forwards combined. You may recall when similar to Bennett, 18-year-old Jarome Iginla joined the Flames when his junior season ended in 1996. As soon as Kamloops was eliminated in the WHL playoffs, Iginla headed to Calgary, put on jersey No. 24, and played in games three and four of the first round series against Chicago, which ended up a sweep for the Blackhawks. That's four rookie forwards in 18 years. Last night, Calgary played five in one game and expect it to be five once again on Friday night in game two because other than lingering questions about Monahan's health, they all deserve to be right back in there. Sam Bennett -- What more can you say. The 18-year-old was a dynamic presence on every shift, skating on the wing with Mikael Backlund and Colborne. It was just NHL game No. 2 for the 2014 4th overall pick but you never would have known it as he played 15 minutes and tied for the team-lead with four shots on goal. On Tuesday, I made a case in this piece that playing Bennett was an absolute must as he would make the Flames better. Well, he sure did. I also suggested once he got in the line-up, he'll likely never come out again and that is also looking like a safe assumption considering he was one of the best players against Vancouver. Johnny Gaudreau - He took a while to get going in game one. In fact, all night the line of Gaudreau, Jiri Hudler and Monahan were a mere shadow of what they've been the past two months when they've been the best line in hockey. Monahan, looking like he's possibly nursing a minor injury, played a role in that. However, Gaudreau got better individually as the game went on and was carrying that puck, dipsy-doodling, and making plays like always. By the third period, he stood out as the best player on that line. Michael Ferland - He took an early penalty that put Calgary on the penalty kill. Derek Dorsett took out Russell heavily along the sideboards and Ferland -- as you want and expect him to do, rushed in to remind Dorsett that hits like that will not be tolerated. Ferland drops the gloves, Dorsett -- in a veteran move, does not. Ferland gets the only two minutes. While some described it as a dumb play by the rookie, I'd instead call it a better play by Dorsett to shy away. Meanwhile, Ferland was terrific the rest of the night. He gets in the offensize zone with pace, finishes his checks with a lot of ferocity that will leave Canucks blueliners looking over their shoulder the rest of the series. Then, showcasing the alluring offensive skills that go with Ferland's size and tenacity, he makes a nice pass to Jones on the tying goal. Josh Jooris and Markus Granlund - Neither were flashy but they certainly didn't hurt the team. Paired together on the fourth line with veteran winger Brandon Bollig, they did what they were asked to do, get in some cycles along the end boards in the offensize zone and limit the amount of damage in the defensize zone. In particular, the energy that Jooris effuses every shift provides a constant spark to this team. It's the presence of so much impressive youth on this hockey club that has so many gushing optimism about the future -- both immediate and long term. Critics love to compare the Flames to the Colorado Avalanche and point to how the Avalanche made the playoffs in 2013-14 but then regressed this season. But for me, it's the personnel where this comparison unravels. Firstly, which Avs defencemen compare with Calgary's top four? Maybe Tyson Barrie slots in on the second pairing. That's about it. More pertinent to today's topic, Colorado had only one rookie in the line-up last year -- forward Nathan MacKinnon. Up front, they had no sophomores. Overall, Barrie was their only second-year player. This year, the Avalanche added only one rookie regular and that was right winger Dennis Everberg. Not exactly a high-impact player. Compare that situation to the Flames -- seven rookies/sophomores in the line-up right now and ready to join the club next year are 2013 first round pick Emile Poirier and Tyler Wotherspoon on the back-end. The dots on the advanced stats line charts may be similar if you overlay Calgary's high shooting percentage and low possession this year on top of Colorado's similar numbers from last season, but there is way more to the equation than that. The Flames are full of young kids that are only going to get better. That line chart is changing every day and heck, Bennett was not even with the team to contribute to those so-called unsustainable numbers so it would be overly presumptuous to paint him with the same brush. So, how it is that these young and inexperienced players on the Flames are handling the enormity of the moment of first being in a playoff race and now being in the playoffs, yet staying so poised and continuing to look like seasoned veterans? For one, part of it is in their make-up as players. We all know how calm, cool and methodical Monahan is. He's got the presence of a 30-year-old, not a 20-year-old. Some are just more naturally able to handle the pressures than others. Age is another factor. Other than Bennett, the other four rookies are 21 or older with Jooris a relative 'old man' at age 24. With age comes more experience in similar high-stakes situations at different levels -- college, junior, international. Lastly, credit to general manager Brad Treliving and Hartley. While in this day and age, so many get caught up on on-ice performance and a player's raw analytics, underrated are the intangibles like experience, veteran presence, and leadership that can be critically important at this time of year and is an ingredient all successful teams must have. In the visiting dressing room in Rogers Arena, Bennett's dressing room stall is beside Bollig's. This wasn't done accidentally. While Mason Raymond or Drew Shore are both better players, it's Bollig that is playing on a line with Jooris and Granlund. While fans hate it, what Bollig brings to the line-up and dressing room is a calming influence. As Hartley likes to say, he's a pro. Plus, he has experience of playing in these types of big games. He has a Stanley Cup ring. Hartley takes heat for his usage of Bollig in particular but it's hard to argue with the results. It's these decisions and how Hartley manages the personnel on his roster -- from inserting a rookie like Bennett right into the fire when no one expects it, to also playing a veteran like Bollig when nobody understands it. But it's these decisions and how successful they've turned out that is why he's a coach in the NHL it's why he'll quite likely win the Jack Adams in June as the best coach in the NHL. It's also why Hartley and his hockey club hold a 1-0 lead in the series against Vancouuer.